Born in England to Australian parents, Frank Ifield started his career in Australia but returned to England in 1959 where he was produced for Columbia by Norrie Paramor. At his website, Frank refers to himself as an "English born Australian". Although I Remember You was his only major national hit in the USA (#5), it was followed by a series of hits in the UK and Australia, usually pop rearrangements of Tin Pan Alley or country standards, notably Lovesick Blues/She Taught Me To Yodel (1962, #1 UK, #44 USA), Wayward Wind (1963, #1 UK), and I'm Confessin' (1963, #1 UK, #58 USA). The distinctive harmonica on I Remember You is by Harry Pitch, whose diverse credits include Mr Bloe's cult instrumental classic Groovin' With Mr Bloe (#2 UK, 1970) and the theme to Last of the Summer Wine, the British comedy series. Recording of a performance in Hamburg, released in 1977 on the album Live! At The Star-Club in Hamburg, Germany; 1962. 78 rpm record on Columbia label, recording session 29 January 1942. 78 rpm record on Decca label, #4132, recording session 10 December 1941, with vocals by Bob Eberly. Jimmy Dorsey and his orchestra also appeared in The Fleet's In (see below). In the film The Fleet's In, released 24 January 1942, directed by the song's co-writer Victor Schertzinger. Bob Eberly, Helen O'Connell and Chorus are credited with vocals in addition to Dorothy Lamour: full details at classicmoviemusicals.com. Recorded by numerous artists: there is a list of nearly thirty at The Johnny Mercer Educational Archives (JohnnyMercer.com). Same title but not the same song as "I Remember You" by Frank Ifield. 1908-1909? This has been cited as the original version, but it is a different song. Ada Jones seems to have recorded this more than once, including as a duet with Billy Murray on Victor (1909: Victor discography at Online Discographiocal Project). British-born Ada Jones (1873-1922) was a popular singer, a pioneer in the history of recorded music. She was the first woman to be recorded regularly, beginning in the late 1890s. 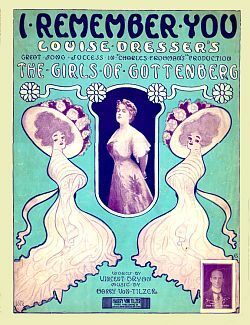 Song apparently added to the American production of The Girls of Gottenberg, a show originally staged in Britain. See Harry Von Tilzer, His Life and Music at the Parlor Songs website, where you can also read the lyrics. Thank you to honeydhont and Joop Jansen.